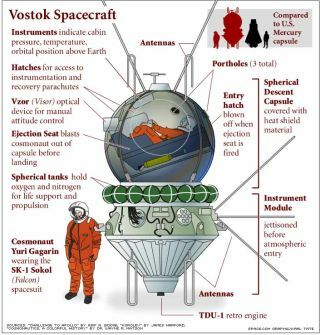 This diagram details the workings of the Russian Vostok spacecraft. A big piece of spaceflight history goes on the auction block on April 12, the 50th anniversary of humanity's first trip to space. The high-end auction house Sotheby's is selling off an old Soviet capsule that was test-fired into space just three weeks before Yuri Gagarin launched into orbit on April 12, 1961, the aucton house announced yesterday (Feb. 24). The spherical Vostok 3KA-2 capsule is identical in design to the Vostok 3KA-3 — later renamed Vostok 1 — that carried Gagarin. The 3KA-2, which bears singe marks from its fiery re-entry into Earth's atmosphere, is expected to fetch between $2 million and $10 million, the news agency Reuters reported. Sotheby's will auction the capsule off at its New York headquarters and is displaying the craft there until the sale. The anonymous owner bought the capsule privately from Russia several years ago, according to Reuters. The Vostok 3KA-2 blasted into space just 20 days before Gagarin did. The test capsule carried a life-size mannequin nicknamed Ivan Ivanovich and a dog called Zvezdochka ("little star" in Russian), according to the Russian news service RIA Novosti. The capsule — along with Ivan and Zvezdochka — made it back down to Earth safely after completing one orbit. The Vostok 3KA-2's spherical cabin is about 8 feet (2.5 meters) in diameter and made of aluminum alloy, Reuters reported. The capsule once contained about 1,800 pounds (818 kilograms) of equipment and instruments, much of it classified as "secret" until 1986. But the interior has been stripped for security reasons, according to RIA Novosti. The Vostok 3KA-2 is an exact double of the capsule that carried Gagarin into space a few weeks later. Gagarin's Vostok 1 craft resides at the Russian rocket maker Rkk Energia's Museum near Moscow, Reuters reported. The Soviet Union's Vostok space program ran from 1960 to 1963 and notched numerous spaceflight firsts. In 1960, for example, two dogs named Belka ("Squirrel") and Strelka ("Little Arrow") became the first animals to orbit the Earth and come home alive. And in 1963, two years after Gagarin made history, cosmonaut Valentina Tereshkova made some of her own, becoming the first woman in space.